This vibrant scroll is an example of the revival of Hebrew manuscript illumination in the eighteenth century, as well as the reliance of artists on existing printed images. Even after the advent of printing in the mid-fifteenth century, Hebrew scribal arts were still practiced, as required by rabbinic law, for the creation of Torah scrolls, Esther scrolls, phylacteries, mezuzot, and divorce documents. Beginning in the first decade of the eighteenth century, a group of scribe-artists, initially working in Vienna, created lavishly decorated books of prayer for personal use. These luxury manuscripts were produced for wealthy Court Jews who acted as financial agents for ruling members of the Hapsburg Empire. When painting the ornamentation of books and scrolls, artists were inspired by printed works. 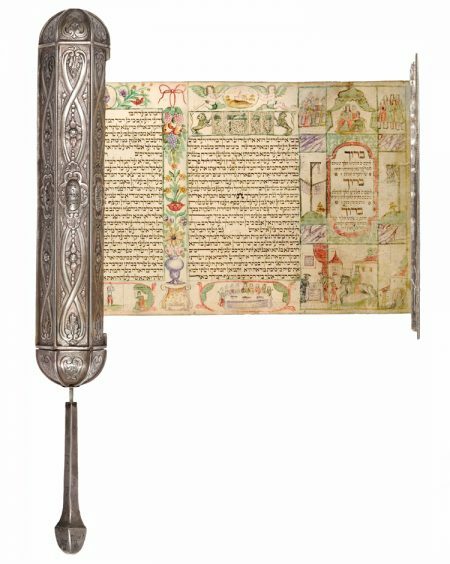 The decorative program of this megillah is modeled on the engraved Amsterdam border (cat. no. 82). In the opening panel, Ahasuerus and Esther, enthroned and flanked by members of their court, are placed above the three benedictions, while five scenes from the story fill the remaining border. The same decorative programs were used by eighteenth-century scribe-artists to embellish both illuminated codices and scrolls. 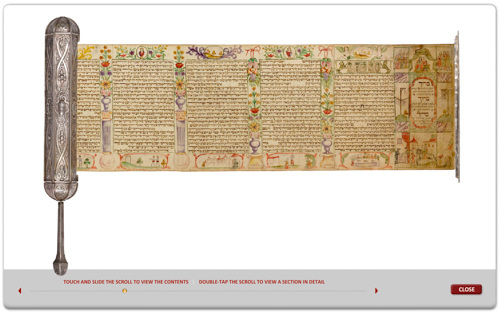 The first column of text in this megillah opens with a large, filigreed initial word panel flanked by two rampant, double- tailed lions. Not usually found in megillot, initial word panels of this type were common graphic elements in Haggadot, Grace after Meals books, and other compilations of specialized prayers produced during this period (cat. no. 35). The last column of this scroll contains the blessing recited upon completion of the reading of the megillah. This is followed by the liturgical hymn Asher heini, arranged according to the Hebrew alphabet. Below, five figures from the Purim story stand within oval cartouches; they illustrate the final phrases from the Purim song Shoshanat Ya’akov: “Cursed be Haman who sought to destroy me; blessed be Mordecai the Jew. Cursed be Zeresh the wife of [Haman] who terrorized me; blessed be Esther who [interceded] on my behalf . . . and may Harvonah [the king’s servant] also be remembered favorably.” The scroll was later fitted into a hexagonal silver repoussé case inscribed to Rabbi Ephraim Fischel of Rozdol (Ukraine) 15 Adar 566 (5 March 1806). Christie 1932, lot 214; Stern 2007, pp. 62–65.